Seeing the circus is a bit of a rite of passage for most children. The thrill of being amazed and marvelled by strange and wonderful goings on up on the stage. It's something magical that everyone old and young are captivated by. Cirque Berserk is a show based on the startling and stunning array of acrobatics and stunts that keep people on the edge of their seats. 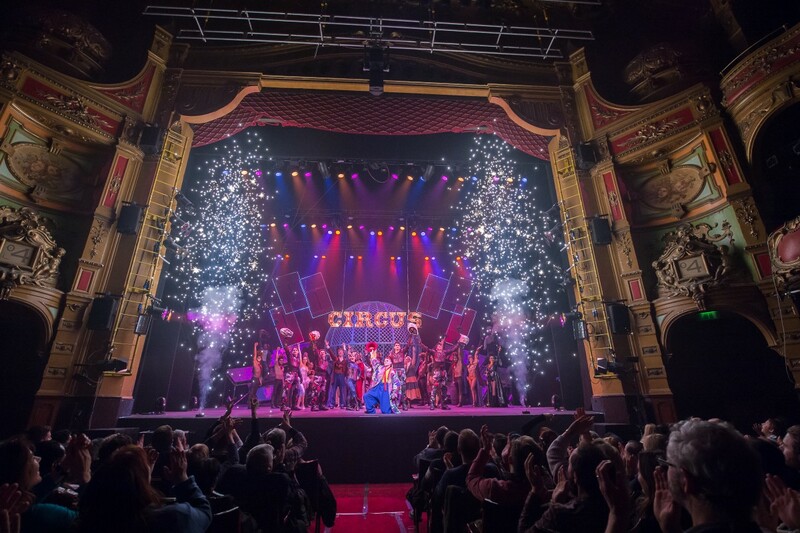 We were recently invited to watch Cirque Berserk at the Kings Theatre, Portsmouth to have a night of fun and fantasy! The Kings Theatre, Portsmouth is based on Albert Road and has all the quintessential classic theatre vibe. It's worth noting that due to the age of the theatre, there isn't much leg room in the stalls, but you have a pretty good view of the stage wherever you sit. So Max didn't need a booster seat, or to lean across to see through people. Sitting down in our seats we were greeted with a circus sign, some ropes and a metal sphere that we had heard held a motorbike stunt. As soon as we were sat down, an announcement went over the theatre to encourage people to get their phones out and take photos and videos. Whilst it's a refreshing change, I was concerned that people would record the entirety or take advantage of it. Luckily people were really respectful and didn't have their phones out the whole way through! The show was far too interesting and gripping to become distracted. The show kick started with the Timbuktu Tumblers that got the crowd pumped and ready for what was to come. What followed was an amazing array of clowns who kept the mood and spirits up with some light relief between the tense acts. Max absolutely adored them and was probably the loudest kid in the theatre, laughing away and shouting along with the show. There were acrobats that spun in the sky and left us with our hearts in our mouths as they fell and danced amongst ropes and hoops. There were performers that juggled fire, including one that spun fire on her feet and literally left me with my jaw on the floor. It was amazing to see how much skill and enthusiasm went into each and every act and I was so impressed that I couldn't keep my eyes away. Max's favourites were definitely the most daredevil of the bunch. The knife throwing couple that had knives hurling at the woman, including ones set on fire. It really was tense to watch, and I have to admit that I did look away as I'm too much of a scaredy pants to watch even though I knew that nothing would go wrong! Finally, the big spectacle was a superb motorbike stunt. Towards the end of the first act, two motorbikes took to the sphere to speed around and upside down. A lady jumped into the sphere too to leave us all shocked and amazed that she managed to dodge and swerve two motorbikes. The end of the show was a hair raising four motorbikes that sped up to 60mph around the sphere in a choreographed spectacle that left everyone's jaws wide open. I can honestly say that Cirque Berserk was a show that left us in awe of the magical things that people can do. It shone a spotlight on skills and tricks that still baffle me to this day and I can highly recommend it to anyone with kids that love the daring and unique. A fantastic night out for all, and the crowd's roaring cheers just reinforced how brilliant we thought it was. Thank you Cirque Berserk for the amazing invitation, we can't wait for the next opportunity to run away with the circus.